Mangaluru, July 12, 2018: Karnataka State Union For Differently Abled Service Organisation general secretary Vasanth Kumar Shetty urged the state government to set up a separate ministry for the Empowerment of Differently Abled and Senior Citizens and earmark a budget amount separately for the welfare of differently-abled. Speaking to media on July 11, Tuesday, he said that at present, the department for Empowerment of Differently Abled and Senior Citizens come under the Women and Child Welfare department. The government should also set up a corporation for the development of differently-abled. 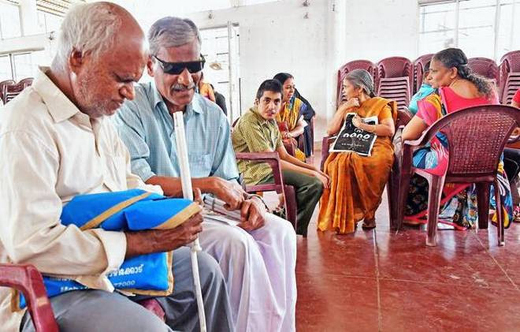 The teaching and the non-teaching staff serving in schools for differently-abled should be provided with facilities, service security and retirement benefits on the model of those serving in aided schools. Instead of the child-centric grant, which came into existence in 2011, the government should fix a grant of Rs 10,000 to each child in the residential school for the differently-abled and Rs 8,000 to each child in non-residential school for differently-abled. As per the National Trust Act, which safeguards the rights of people with multiple disabilities, a differently abled child should not be pressurised. Unfortunately, the government, through its biometric and face reader attendance system, is terrorising the kids. Is it possible to get a biometric attendance of an autistic, spastic and Down’s syndrome child? he asked. Even the face reader attendance is causing inconvenience to the children. The government should suspend the biometric attendance system in all the special schools in the state and introduce the old system of attendance. He said that as per the government’s guidelines, all those specially abled in special schools, who are above 25 years, will not come under the government’s grant in aid. In spite of urging the government not to restrict the age limit for children suffering from autism and Down’s syndrome, the rules have not been changed. The government should set up a vocational training centre and rehabilitation centre for such children so that they can be trained in different skills. The mid-day meals supplied to the differently-abled schools through the Kateel Durgaparameshwari Temple has been stopped since November last year. When the issue was brought to the notice of Chief Minister H D Kumaraswamy, he directed the officials to restart the mid-day meal programme. However, the order on the same is yet to reach us, he said. Karnataka State Union For Differently Abled Service Organisation will organise Spandana 2018, at Teachers’ Sadana in Bengaluru on July 14, which will be attended by former chief minister Siddaramaiah.